Today is such a special and exciting day! 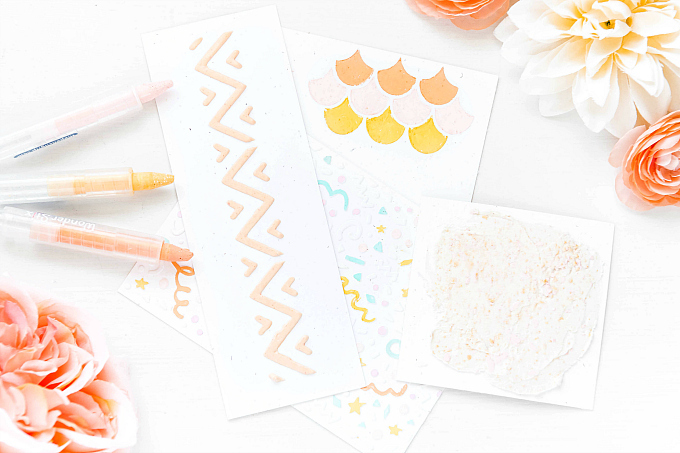 It's my first day over on the Queen and Company blog, sharing some fun cards with the adorable, super versatile Circle Shaped Shaker Set. 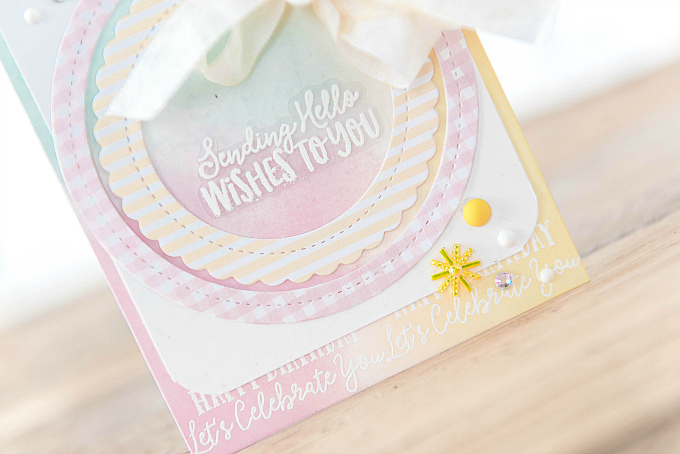 I have lots of fun cards in store for you, but for today's purposes, I'll be sharing three cards, showcasing just how fun and versatile this beautiful shaker kit is! First up, I’ve whipped up a card inspired by all the things we love about the fun festivities Summer brings. Whether you call it a State Fair, a Carnival, or an Exhibition, one iconic feature of this splendid Summertime tradition, is the yummy, colorful food! And so in that spirit, this little number was inspired by the soft, swirly tones of my favorite: cotton candy! 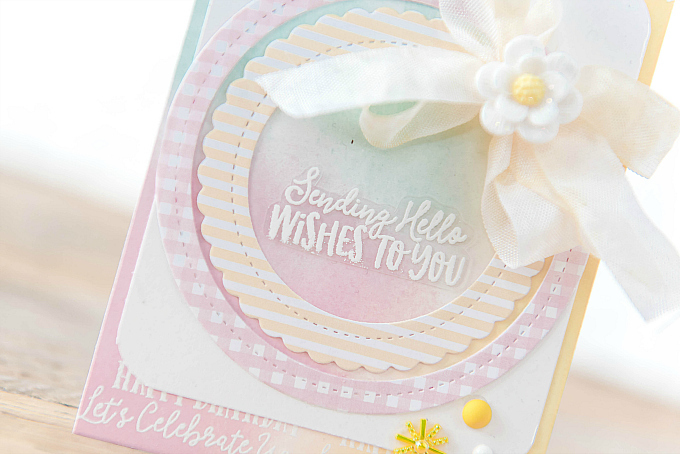 I loved using the circle dies in this kit to make a card that wasn’t all about shakers. It shows just how versatile and fun this kit is to play with. Who doesn't love pretty, scalloped, stitched circles! I paired the lovely circle dies with some pretty prints from a couple of favorite Queen and Co paper sets - Flirty Florals and Stripes, along with swirls of ink blended onto cardstock with PTI's Aqua Mist, Lovely Lady and Lemon Zest, and some pretty heat-embossed sentiments from the Circle Shaped Shaker kit. 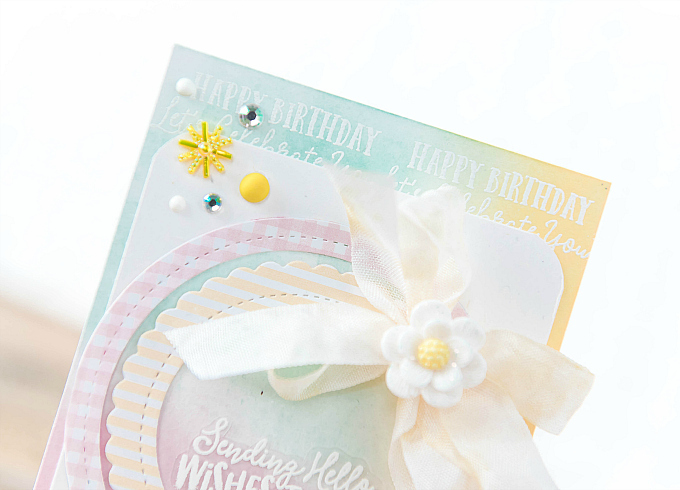 To make the card extra frilly and fun, I added a soft ribbon, a lovely white Glitter Flower, and some of my favorite Queen and Company accents - Iridescent Rhinestones, Rubber Bubbles, and Starbursts. For my next card, I really wanted to shake things up! With a fun, colorful shaker, that is! 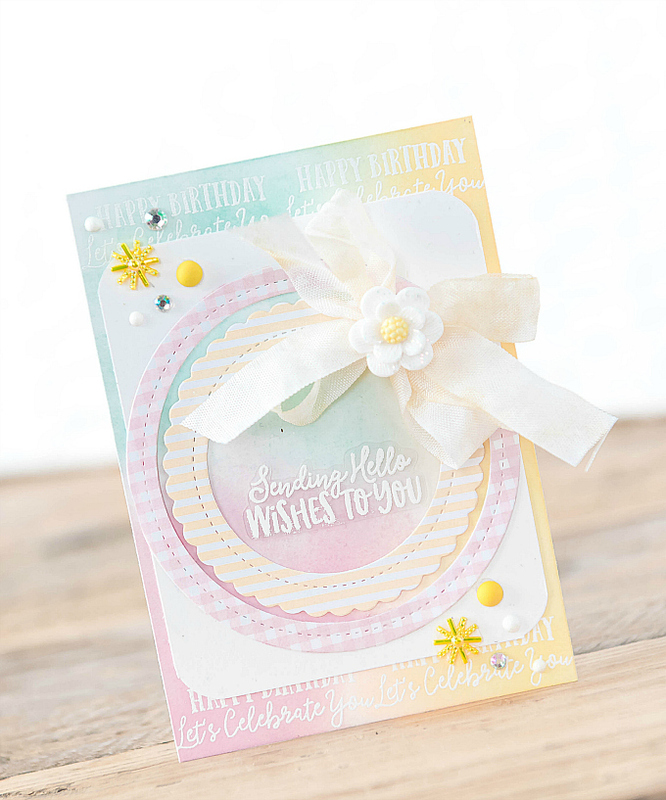 The sweet circle dies included in the kit are perfect for layering, stacking and creating endless possibilities. And the shakers are so easy to put together! 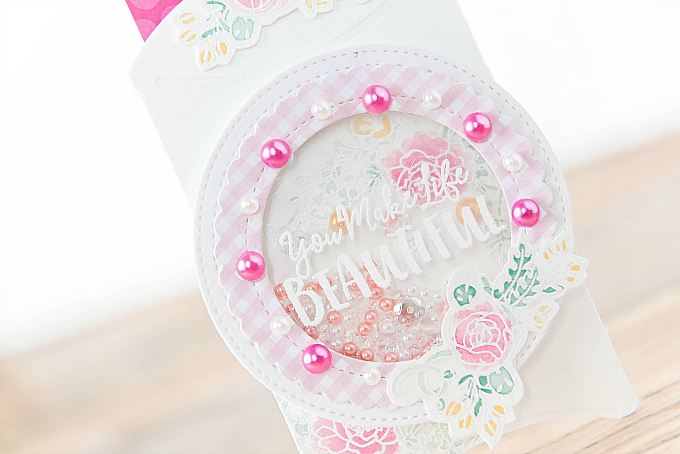 Everything needed is included in the kit - 3 circle dies in varying sizes, 9 self-adhesive and pre-cut foam backers, as well as pre-cut acetate covers, and an adorable sentiment stamp set. Just add paper, and some toppings, and you're all set! For this particular card, I decided to actually create a pocket out of the base, by gluing the bottom and sides of the base together, and leaving the top open. This way it is super easy to tuck in a note, a gift card or any other little treasure! Here, I tucked in a bit of patterned paper from the Dots collection. To the base of the card, I added a couple of stamped and heat-embossed flower images using Sizzix In Bloom stamps – but any stamped image would do well here. 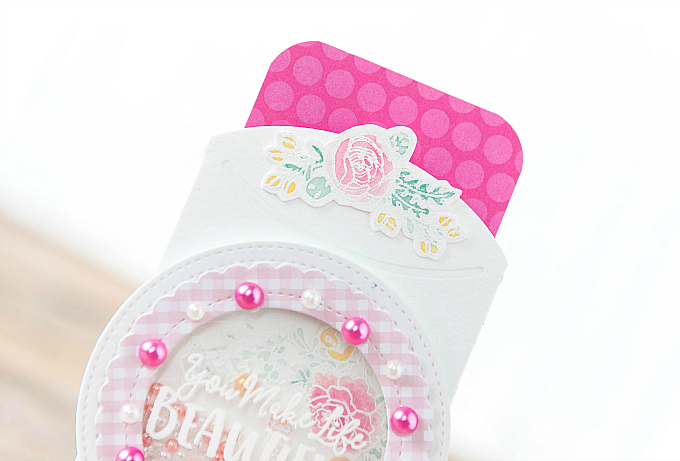 I then used the circle die-cuts to cut two circles, using cardstock and Queen and Co gingham paper from the Flirty Florals pad, and then I adhered this easy-peasy-to-assemble shaker onto the card. I used a mix of shaker toppings from the Pearlies Bright set to fill the inside, and a few little Orchid and Snowflake White pearls to decorate the outside. I used the included stamp set to stamp and heat-emboss a sentiment and also added two more watercolored floral bundles as a finishing touch. For my last card today, I wanted to play around with the various circle die-cuts and focus more on the background. I love, love, love how this turned out! It was such a breeze to put together, too. I used one of the circle dies to cut out a variety of shaker circles, so I was left with a pile of the inside circles. I decided to cut them in half, and layer them around the edges of the card, and add 1/4 circles to each corner. For the center, I used one of the shaker dies to cut out a frame, and then also cut coordinating inserts. I stamped and heat-embossed the sentiment using Sizzix In Bloom stamps and paper from the Dots collection pad. Around the frame, I added yellow Glitter Flowers, Iridescent Rhinestones, Pearls, and Starbursts. So fun playing with this kit and discovering all the possibilities! This sweet little kit, as well as most of the goodies I've used on these projects, are available directly on the Q+C website, here. I've included handy links to all the products below as well. Oh I am in LOVE with what you did with the circles on this set!!! Your layering is superb and your little additions of the flowers and pearls are perfection. I think my favorite is the last card. So unique!!!!! You rocked this!!! Hurrah! I said you should be on a DT! Bet they'll be selling out with the inspiration you've provided, Ivana! Your style is so wonderful--love every one of these! Greta, you called it! ;) I'm slowly easing back into DT work and so very excited to be showcasing these sweet crafty supplies! Thank you so much for your love and support, dear crafty friend!